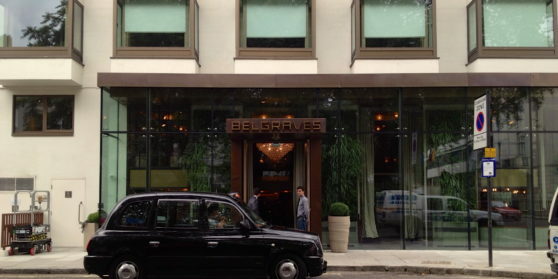 With the discreet feel of a private club, Belgraves is the chic London boutique hotel where locals and travelers who thrive on the leading edge unwind with a drink on our cigar terrace, framed with green walls of flowers. From the lobby, lounges and restaurant on up, peripatetic Londoner Tara Bernerd has brought her distinctive glamour home to our London boutique hotel, with sleek contemporary lines warmed by dark, rich textures. Thompson knows London’s galaxy of culinary options presents any visitor with a dilemma. And Belgraves is proud to compound your quandary with irresistible opportunities. The singular cigar terrace. The discreet charms of the Snug. And of course Pont St.—showcasing the passionately eclectic style reflective of chef Sophie Michell’s worldwide sojourns. Belgraves takes London event space to an entirely new level in sumptuously appointed, high-profile settings with the discreet atmosphere of a private club. Our business hotel in central London offers exemplary surroundings for book launches, press events and breakfast meetings, cocktail receptions and corporate events, private dining, holiday parties and weddings.